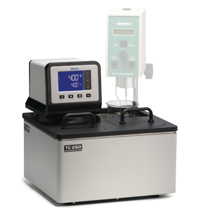 AVAILABLE for use with Brookfield viscometers and rheometers, the new TC series circulating water baths offer a number of improvements over earlier models. All four models in the range offer a choice of digital or programmable controllers, boasting control heads that can be swivelled into whatever position best suits the operator. Each of the models – TC-150, TC-250, TC-550, and TC-650 – now has a menu-driven touchscreen interface offering operation in any one of six languages, and also benefit from improved aesthetic design. Languages available are English, Spanish, French, German, Chinese, and Arabic. The new design features rounded corners, a new colour scheme, and a composite deck that is both stain- and chemical-resistant. The new TC Series offers USB, ethernet, and RS-232 connectivity, and generate operating temperatures (depending on model) from -20C to +200C.